Sri Ramakrishna Pramahamsar used to encourage women to cook food at home regularly. "Cooking food is a great means to keep mind healthy and happy. Sita, Draupadi and Parvati are all adept in cooking. Sri Mahalakshmi cooks and even serves food to all, with Her own hands" said Sri Ramakrishna Pramahamsar! 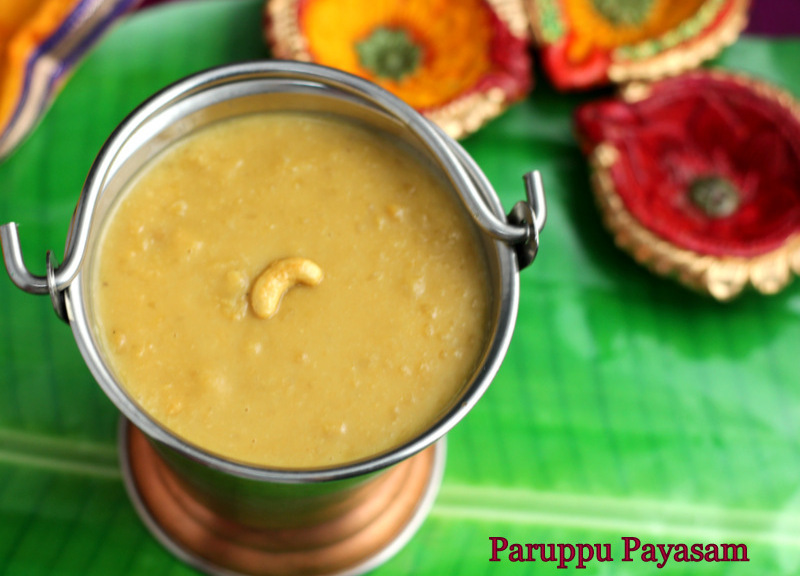 Pasi Paruppu or Payatham Paruppu Payasam is one the traditional South-Indian 'Neiveidyam' recipes which is prepared during festivals or special occasions and prayers. 1. Heat 1/2tsp of ghee in a pan, roast the Dals / lentils for 2mins until aromatic. Add twice the amount of water and pressure cook for 4-5 whistles or about 10mins. Dals cook fast, so do not cook for longer as it makes it into a thick paste. Alternatively, after roasting, just add enough water and let it cook in the pan itself. But, this process takes longer time. 2. Once pressure comes down, open the lid, add Jaggery and stir continuously until it dissolves completely and comes to a boil. Keep the heat on medium only. Add some water to Jaggery and bring to a boil. Then, strain it through a cloth to remove impurities and add to the cooked Dal. 3. Meanwhile, grind coconut and few cashews into a fine paste and add it to the Dal-Jaggery mixture. Let it boil on medium heat for another 3-4mins. 4. Switch off the flame, add powdered elaichi and milk. Payasam thickens as it cools. So add milk accordingly. Do not add milk while heat is on. Sometimes Payasam curdles when hot milk is added. 5. Roast the remaining cashews in 1/2tsp ghee and add it to the Payasam. Offer this as Neiveidyam to God.